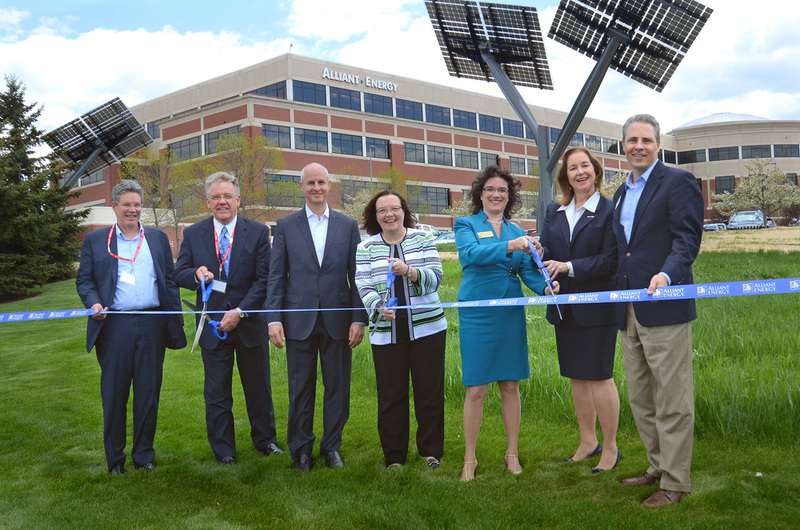 In collaboration with the Electric Power Research Institute (EPRI), Alliant Energy integrated multiple solar and clean energy technologies — including 23 Spotlight Solar trees — to create a center for research, education and collaboration. The initiative will study different types of technologies in a Midwest climate to provide the utility with valuable insights into the best-suited solar technologies for the region. Located at Alliant Energy’s Madison, WI headquarters, the unique project brings together a variety of different solar photovoltaic (PV) technologies, such as ground-mounted tracker systems, rooftop arrays, and parking canopies, and totals more than 1300 solar panels and 290 kilowatts (kW) of installed capacity. The demonstration site also includes a battery energy storage system and electric vehicle charging stations. Real-time monitoring of the systems is accessible via a Web-based dashboard. The Alliant Energy project features the largest installation of Spotlight Solar trees, with 23 striking clean energy-generating structures providing a distinctive visual element to the project. Alliant Energy and EPRI sought to encourage the public’s engagement with solar technology and chose Spotlight’s elegantly designed structures to bring solar to eye level in an engaging form. Alliant Energy has several solar projects in development throughout its Iowa and Wisconsin service territories. Exposure -- Alliant Energy's customers and visitors, including student groups. EPRI members. Alliant employees.